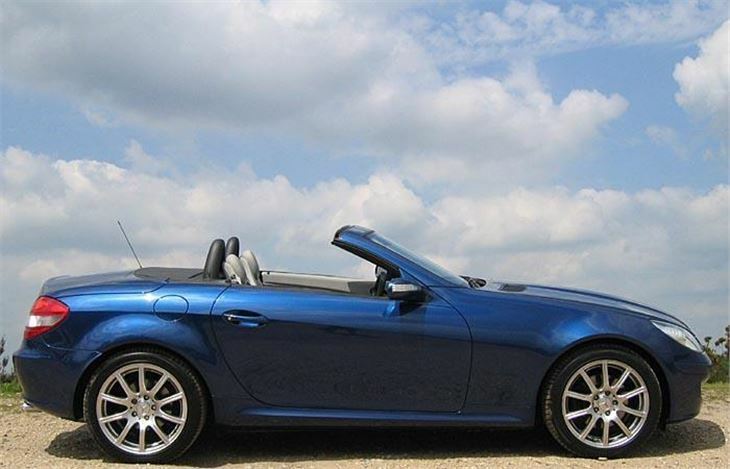 The Mercedes Benz SLK in 2006 is probably the most exquisite piece of street jewellery you can buy. It’s a ‘must have’ ‘want one’ kind of car on its looks alone. 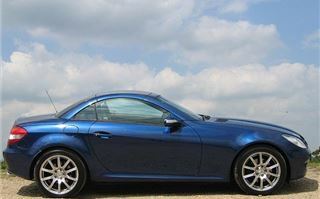 A bit girly, if you had to get critical, but Clarkson smokes an SLK55 so it must be okay for blokes too. 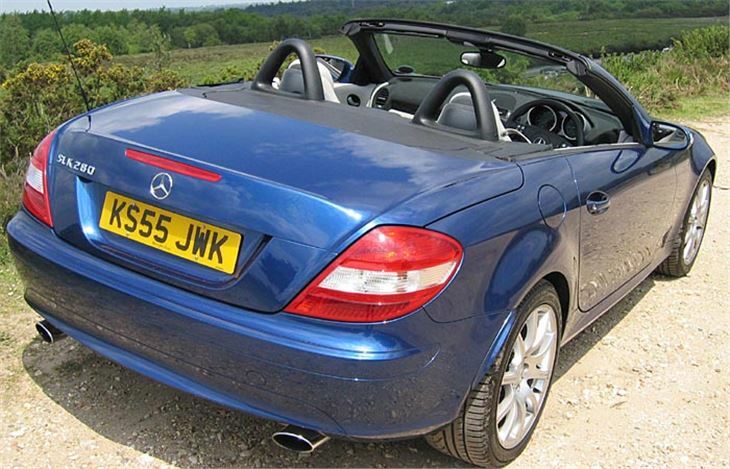 It has all the bits of the original SLK, most importantly the electric folding hardtop. But it looks vastly better. A bit like a shrunken Mercedes McClaren SLR with better proportions. Come to think of it, personal preferences aside, there probably isn’t a better-looking car than the new SLK anywhere on the planet. You pay for that, of course. Prices start at £28,272, rise inexorably to £50,757 and it’s alarmingly easy to add £9,000 - £10,000 from the options list. My specced up 280 came in at £40,670 which takes an awful lot of hairdressing to raise. The roof works brilliantly. You just toggle a button. And even with an inflatable space-saver tyre underneath, there’s enough room in the boot for a reasonable amount of luggage. Mercedes maximises the capacity by providing a hard plastic luggage cover between your stuff and the space the roof needs to fold into. You can get 208 litres in there top down, or 300 litres top up. The 7-Gtronic box can be left on its own, or you can start changing your own gears at any time using the rockershifters on the back of the steering wheel. Press the forward end to change down and the end closest to you to change up. But seven gears are a lot of cogs, and to get a blast of speed from ‘Drive’ you may have to toggle down two or three ratios rather than one or two. 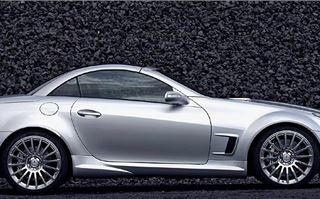 Like the new SLs the SLK280 has a great sportscar exhaust note. 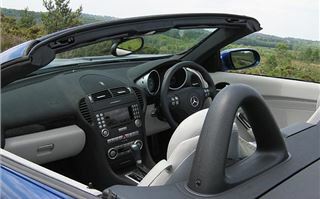 Other drivers expect a ‘280’ to be a bit limp-wristed compared to an SLK55 AMG or even a 350, but if the occasion arises it rises to the occasion with a 0-60 blast in 5.9 seconds. The 7-Gtronic is actually a tenth of a second quicker than the 6-speed manual. It grips like Evostick too. 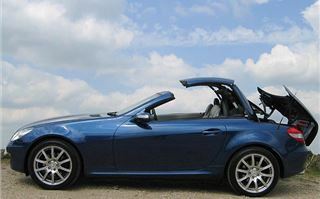 On all SLK’s the rear tyres are fatter than the fronts so they are very difficult to slide (impossible, in my case as I’m not that leery a driver). However, this comes at an expensive price. With the optional 225/45 R17 fronts and 245/40 R17 rears the ride quality is the most bone-jarring of any car in my recent memory. Speed cushions have to be taken at 5mph if you don’t want to smash your coccyx or gnash your teeth. The shockwaves reverbate thoughout the car. ‘She’ will not be amused. Even a section of road near me that hasn’t deliberately been turned into an obstacle course was extremely unpleasant to drive along. So, word of warning here. Stick to the standard 55 and 50 profile tyres on 16” wheels. 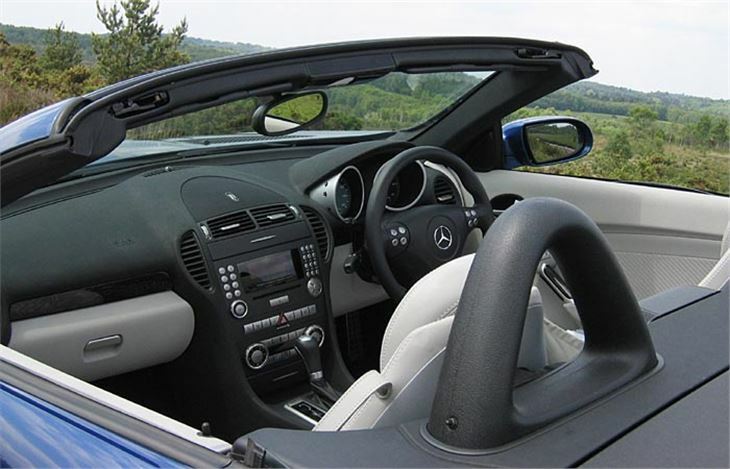 The SLK is naturally up against sportier cars bought either for their ability or simply as status symbols, like the Porsche Boxster. 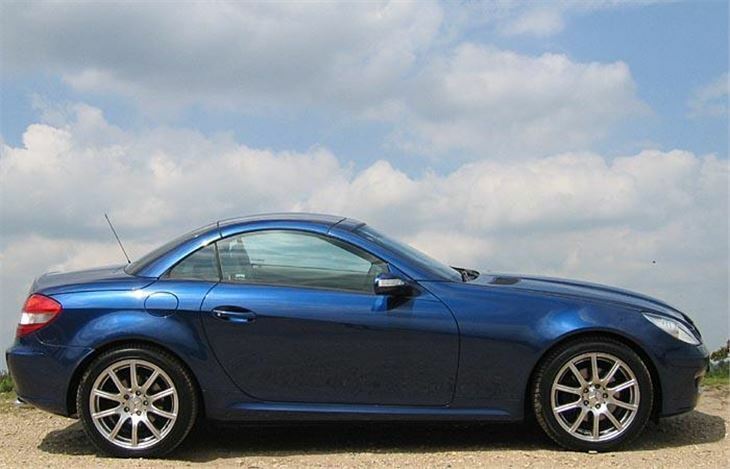 The SLK doesn’t drive as well as a Boxster, but it doesn’t look like an upturned bathtub either. 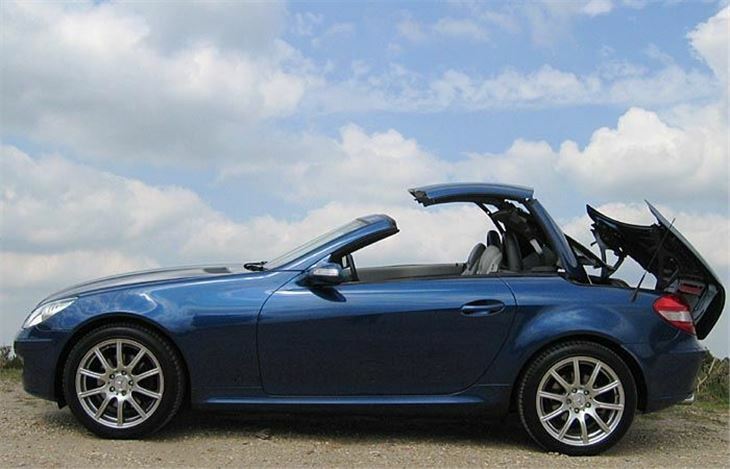 At the lower end of its price range you could instead go for a Honda S2000 or a Nissan 350Z or an Audi TT or, of course, a BMW Z4. But any bloke over 40 just looks silly in an S2000. A Nissan 350Z is the most hairy-chested and butch of the bunch. 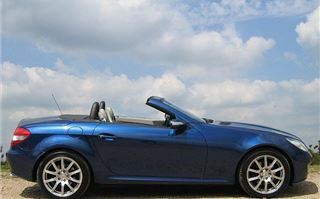 A Z4 offers the widest choice of engines and transmissions, including autos for the ladies and the softies, but doesn’t have an electric folding hard top and isn’t a Mercedes. And the Audi TT has just been replaced by a new one which I can’t tell you about. So, with the SLK, Mercedes has a niche market completely sewn up. All the status of a Mercedes electric folding hard top roadster. A choice of manual or auto. Stunning, gorgeous looks. And a decent drive as well.